According to the firm’s data, as of April 4, various transactions were overpaying for fees, at a time in which crypto transactions are becoming slightly more expensive on the Bitcoin network, partly thanks to the cryptocurrency’s recent surge to a five-month high. A tweet shared by Bit Consultants show’s BTC’s mempool – the size of the number of unconfirmed network transactions – seemingly included transactions in which users paid over 600 satoshis per byte. Currently, according to Earn.com, the “fastest and cheapest transaction fee” is of 160 satoshis per byte. With the median transaction size of 257 bytes, the website notes a transaction fee should be of a total of 41,120 satoshis, or about $2. Other resources, like BuyBitcoinWorldwide, point to a $1.7 transaction fee for a confirmation within an hour. Per Bit Consultants, users may be paying too much in transaction fees because of consumer wallets, as these may be incorrectly estimating the appropriate rates. Notably, the size of blocks on the Bitcoin blockchain and the transaction fees on it are closely related, and have been a subject of debate for years. The debate culminated in 2017, when cryptocurrency prices started surging and more people were conducting transactions. 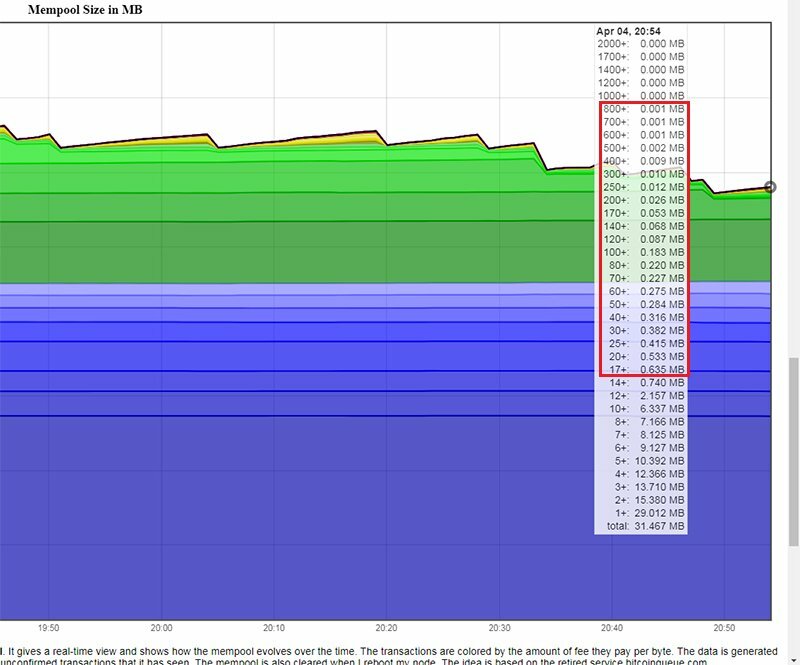 As this happened, BTC’s 1 MB blocks became full and fees went over two digits, with their peak being close to $50. This saw some users point to cryptocurrency exchanges as the culprits, as they weren’t batching transactions to save up block space. Those who believed in bigger block sizes ultimately forked the blockchain to create Bitcoin Cash (BCH), a cryptocurrency that now has 32 MB blocks. The BCH network endured another contentious hard fork in November of last year, when Bitcoin Satoshi’s Vision (BSV) was created. Various improvements on the Bitcoin network have, however, made it more efficient. The implementation and adoption of SegWit allow blockspace to be used more efficiently, while its layer-two scaling solution, the Lightning Network (LN), has been taking various transactions off the blockchain. In order to not overpay for fees, Bit Consultants advised users to pick wallets with features that help better estimate and customize transaction fees, and have ‘replace-by-fee’ options that allow users to replace a transaction fee with a higher one. Moreover, the firm claimed users should check the flagship cryptocurrency’s mempool before making a transaction, in order to optimize their fees, so their transactions are included on the next block.